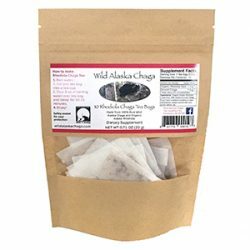 10 herbal tea bags hand-filled with 100% powdered wild Alaska chaga mushroom and wild Alaska blueberries. Blueberries add a unique flavor profile making a slightly sweet, smooth cup of tea. 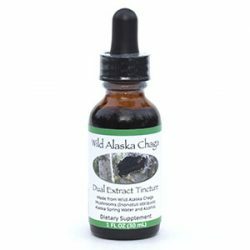 A true taste of Alaska in every cup! 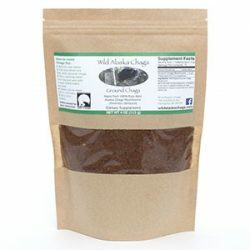 Our blueberry chaga tea recipe is printed on the label (pictured below), but for more information check out our instructional video: How to Make Chaga Tea. 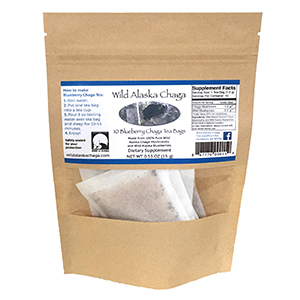 Each tea bag contains 1.5 grams of blueberry chaga powder, measures 2.5 x 2.75 inches, and is packaged in a resealable storage bag to maintain freshness. We enjoy it plain, but sugar or honey can be added to taste.